South Korean marines patrol on Yeonpyeong Island, Dec. 17, 2010. North Korea has warned the South of an attack more bloody than the one last month if it goes ahead with plans for a live-fire drill, triggering new tensions on the Korean peninsula. The warning on Friday came as the United States and China held talks on the Korean crisis and as a U.S. "troubleshooter" flew to Pyongyang in a bid to ease tensions following the Nov. 23 North Korean artillery attack on South Korea's Yeonpyeong Island. Two South Korean marines and two civilians were killed in the bombardment, which also injured 18 others and damaged dozens of homes. The attack came after a firing drill into the sea by South Korean marines based on the island. Outraged at the North Korean shelling, the first on civilian areas since the 1950-53 Korean War, Seoul plans a one-day, live-fire drill on the tiny island sometime between Saturday and Tuesday. North Korea threatened Friday to strike again if South Korea goes ahead with the war exercise while Seoul has fortified Yeonpyeong with more troops and artillery and vows to use air power against any future attack. South Korea's Defense Ministry said the exercise planned for Dec. 18-21 will go ahead. 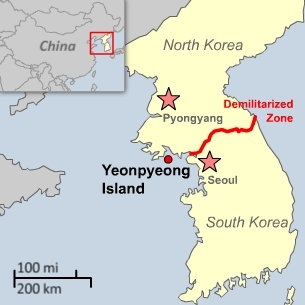 The North "will deal the second and third unpredictable self-defensive blow" to protect what it calls its territorial waters if the South holds the drill, said a military statement carried on Pyongyang's official KCNA news agency. "It will be deadlier than what was made on Nov. 23 in terms of the powerfulness and sphere of the strike," it said. Russia summoned the ambassadors of South Korea and the United States to express "extreme concern" and urged the two countries to halt the exercise to prevent "the further escalation of tensions," the Russian Foreign Ministry said. U.N. Secretary-General Ban Ki-moon urged North Korea to show restraint and called on both Koreas to reduce tensions. The United States insists that the live-fire drill poses no threat to the North and has warned Pyongyang against "further provocative action." "It's hard to see how a routine live-fire exercise which has been held in the past poses any kind of threat to North Korea. In fact, it does not," State Department spokesman Philip Crowley told reporters. "A country has every right to train and exercise its military in its own self-defense," he said. "North Korea should not use any future legitimate training exercises as a justification to undertake further provocative action." North Korea's threat also came as U.S. diplomatic troubleshooter Bill Richardson visited Pyongyang in an effort to "reduce the tension on the Korean peninsula" and as China hosted U.S. Deputy Secretary of State James Steinberg for talks on the Korean tensions, among other issues. China's top diplomat, Dai Bingguo, called for closer coordination over the Korean peninsula during his talks with Steinberg, the number two official in the U.S. State Department, the state-run Xinhua news agency reported Friday. The Beijing talks were termed "useful" by Washington. Sung Kim, the U.S. envoy to stalled multilateral talks on North Korea's nuclear disarmament, also held talks in Seoul Friday with his South Korean counterpart Wi Sung-Lac. The United States, China, the two Koreas, Japa, and Russia are members of the denuclearization forum which the North abandoned in April 2009, a month before its second atomic weapons test. The forum's host, China, and Russia are both attempting to revive the six party talks to ease the tensions. But the United States and its regional allies South Korea and Japan have all urged Beijing to do more to rein in North Korea, which depends on China for economic and diplomatic backing. They also want North Korea to mend ties with its southern neighbor and show serious commitment to abandoning its nuclear weapons drive. Pyongyang's disclosure last month of an apparently working uranium enrichment plant—a potential new source of bomb-making material—also heightened regional security fears. U.S. officials have said China's hands-off approach merely encourages Pyongyang to pursue confrontation. Reported by RFA's Korean service and by news agencies. Written in English by Parameswaran Ponnudurai.